Itâ€™s a depressing spectacle: on both sides of the Atlantic, policy-makers just keep falling short â€” and the odds that this slump really will turn into Great Depression II keep rising. In Europe, leaders rejected pleas for a comprehensive rescue plan for troubled East European economies, promising instead to provide â€œcase-by-caseâ€ support. That means a slow dribble of funds, with no chance of reversing the downward spiral. Oh, and Jean-Claude Trichet says that there is no deflation threat in Europe. Whatâ€™s the weather like on his planet? What follows here are simply a few charts to illustrate further the argument I developed yesterday as regards the significance of the deflation threat which now exists in the eurozone. The argument is that the ECB is once again being far too cautious, and risks allowing the entire eurozone to entire a deflationary cycle which may prove to be a lot harder to get out of than it was to get into. In my view the ECB should bring the refinancing rate close to zero % at next Thursday’s rate setting meeting, and then explore what measures can be taken to introduce a zonewide version of US/Japan style Quantitative Easing as quickly as possible. The key argument I am presenting is that it is a mistake to focus at this point on what is happening to energy, food and other commodity prices. The key issue is what is happening to core prices, and what will continue to happen to them as output contracts further. The other side of the coin are inflation expectations, and as we will see below these are now falling rapidly across Europe. It is very important at this point that these expectations do not get “locked in” to price fall expectations. It is evident that the degree of economic slack in the OECD is now widening rapdily as unemployment rises and capacity utilization falls. The OECD output gap (the difference between current levels of output and some estimate of what “capacity” output could be at this point) continues to widen and is now only second in importance to the output gap seen in the early 1980s. 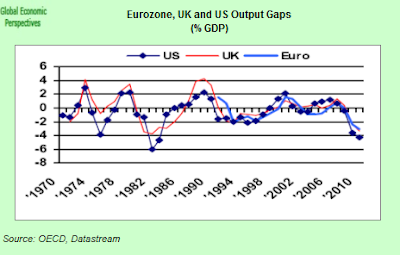 In fact, the output gap is likely to have widened further since the OECD last made its forecasts in November 2008 (the OECD leading indicator has, for example, continued to decline since that point) but the output gaps shown for the US, the UK and eurozone in the chart below are already sufficiently pronounced to make the point quite clearly I think. In fact, spare capacity is a phenomenon which extends way beyond the OECD, and economies throughout the world are operating at below their potential and look set to do so for both the remainder of this year and most of 2010. Global manufacturing has been contracting and global trade has collapsed. 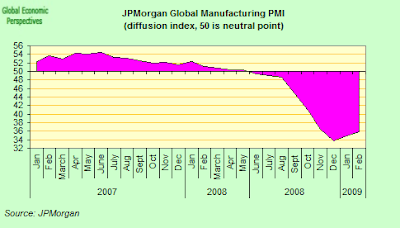 Here is the latest JP Morgan Global Manufacturing PMI. 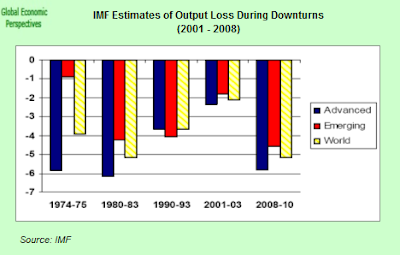 The IMF currently estimates that the cumulative global output loss relative to potential over the period 2008-2010 will be as much as 5% (see chart below). And inflation expectations are falling rapidly. 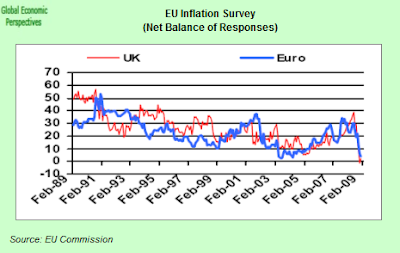 The latest findings in the European Commissionâ€™s own consumer questionnaire show that the net balance of respondents in the UK and the Euro zone expecting prices to be higher this time next year is now at the lowest recorded level – just 2.7% and 4.1% respectively ( see chart below).